Packing for an international trip isn’t the most glamorous part of the journey, but hey, being a stylish jetsetter is hard work! When you see a woman who looks effortlessly stylish while on vacation, you can bet it wasn’t effortless at all. Behind the scenes of it all, she surely spent a good amount of time packing her suitcase and selecting each piece with intention. 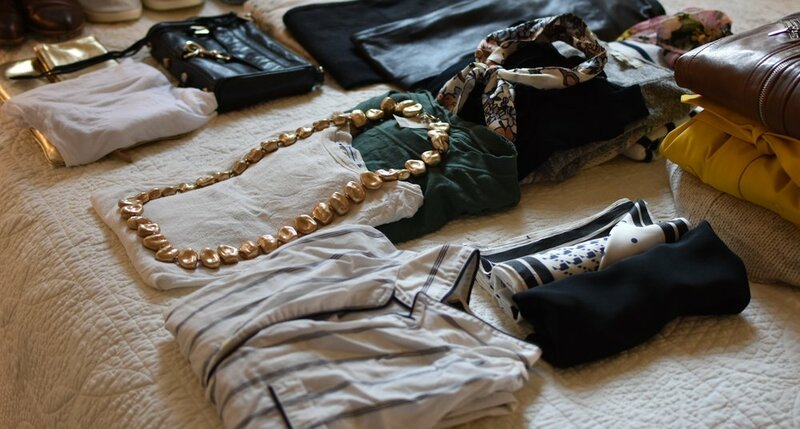 While it isn’t anyone’s favorite chore, packing is a great opportunity to spend a few extra minutes assessing your wardrobe, and your personal style. Most importantly, when you take the time to pack correctly, you end up feeling more confident on the road, which translates into a better vacation experience. As you are digging through your closet trying to throw things together, be mindful to truly see which items you are gravitating towards. That limited space in your suitcase is precious cargo and only the best, most versatile pieces can make the cut. I like to take the opportunity every time I go on vacation to really evaluate what pieces I can’t live without for the duration of the trip. Ultimately, those are the pieces that I will get the most bang for my buck out of both on vacation and at home. It’s a great way to hone in on where the gaps might be in your wardrobe. Sometimes items that are neutral and versatile in color don’t necessarily equate to versatility with everything else in your suitcase. A good trick here is to spend a few extra minutes trying some of the pieces on while you pack. Good rule of thumb: if you can’t figure out a way to mix that item with at least three other items in your bag, it should probably stay home. I prefer to bring a few pops of color, they are AWESOME for travel photos. If you generally wear a lot of neutrals maybe this isn’t as high of a priority, but it can be a great way to ensure that you can still feel like you without access to your entire closet. For this trip, I’m packing a bright yellow raincoat (a la Paddington Bear) and pair of pink floral silk pants. Having accessories that you can dress other pieces up with is the perfect way to add versatility to your on-the-go wardrobe without adding a lot of bulk to your bag. A dangly pair of earrings, an oversized scarf, the perfect clutch…whatever it is for you, accessories should be a priority. I especially love scarves so I will be bringing a few favorites with me to Europe in a variety of colors, prints and sizes. Ok, I have to be honest, I’m totally breaking this rule for my upcoming trip. I bought myself a pair of AllBirds which claim to be THE most comfortable shoes on the planet. I plan to put them to the test on day one in Amsterdam. (I’ll surely be following up on my experience with these). Other than that, I am only bringing shoes I’ve worn many times before. There is nothing less stylish than a woman walking in shoes she clearly is not comfortable in. Do you find yourself feeling overwhelmed packing for your next trip? Shoot me a message and we can chat about it! What are your favorite suitcase packing tips? I'd love to hear how your ensure that you are packing the perfect items for your next journey!